In a recent issue of Bon Appétit, meatballs made the list of favorite foods in 2009. I seemed to miss that trend on menus and magazines but nonetheless was inspired by the ethnic versions in the issue. Kofta, in simplest terms, is a Middle Eastern meatball. The Bon Appétit recipe called for lamb but the beef roast in my freezer was begging to be used. So after a few whirls in the food processor my lean beef was meatball worthy. I saved myself some time and threw the onions in for a few spins. If you have lean beef the onions are key to keep the beef moist. This yogurt sauce was also begging for something – my new favorite fiery ingredient – harissa. The paste of chili peppers, garlic, coriander and caraway took this sauce from blah to bold. Stir all ingredients in medium bowl to blend. Cover and chill. Heat 1 tablespoon oil in non-stick skillet over medium-high heat. Add onions; sprinkle lightly with salt and pepper. Sauté until golden brown, about 15 minutes. Transfer onions to a bowl and set aside. Gently mix beef and next 9 ingredients in large bowl. Using 2 tablespoonfuls for each, roll meat mixture into 1 1/2-inch meatballs (24 total). Add 1 tablespoon oil to same skillet used to cook onions; heat over medium-high heat. Sauté half of meatballs until just cooked through, 7 to 8 minutes. Transfer to baking sheet in oven. Repeat with remaining meatballs. 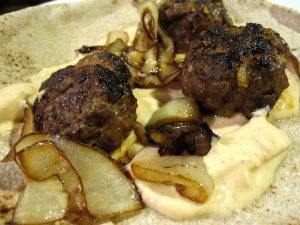 Top warm pita with yogurt sauce, onions and meatballs. How long did you put them in the oven for?